Google today updated its popular Google Maps navigation app, introducing support for CarPlay. With iOS 12, third-party mapping apps work with CarPlay for the first time, giving CarPlay users an alternative to the built-in Apple Maps app. Things we're excited about: rainbows, puppies, and navigating with Google Maps on Apple CarPlay. Check it out to get the best of Google Maps right in your car's built-in display! For CarPlay to work with third-party apps, those apps need to introduce CarPlay support through an update. Google is the first mapping app to have done so, but other apps like Waze and TomTom are expected to debut support for CarPlay in the near future. Now just waiting for Waze to be updated to support CarPlay. Cannot wait! It is a source of wonder to me that people still use Google anything. It isn't just a matter of not caring about one's information being sold by Google, but of the aiding of the establishment of business models which predicate that functionality can only be had by relinquishing fundamental human rights, and, even more importantly, that one should not pay money for anything, no matter what the moral consequences are. I want to pay for things because I don't want dodgy (shady, in US English) operators having to find morally dubious ways of generating profits, because those ways become the norm, and fund our workforce, and thus become the unholy glue which binds our increasingly selfish and unprincipled societies. Increasing amounts of people worldwide depend for their livelihood on companies which operate under business models that rely on misinformation and obfuscation. The wealth of pension funds, financial markets and even whole countries, are incrementally connected to these companies, and regulators, investors, and citizens often can only watch as these companies make a mockery of their laws and social fabric. I feel terrible because I yet lack the technical nous to completely erase Google’s presence in my life, mainly because other people's utter surrender to it make it difficult for me to interact liberally and seamlessly with other users, without jumping through a lot of hoops to avoid Google by proxy. How anyone would actually allow any Google application to be directly installed on the devices they paid a fortune for, and which, although far from perfect, offer the highest protection available against the nefarious intents of companies like Google, Facebook, and of unscrupulous arrivistes, like Cambridge Analytica and others, is beyond my comprehension. Anyways, excited to finally have Google Maps on CarPlay! Been waiting for this for quite some time. Wow, google didn’t wait 800 years to update one of their apps. Of course, when it means they can vacuum up any kind of data, timely delivery becomes an actual thing for them. No need to apologize for length. You may want to apologize for lack of accuracy though. If you can't even get basic facts right, the rest is just... unnecessary. Perhaps provide a counterargument rather than post useless smarm? I didn’t see much in that post that wasn’t quite true. I have no issues with Apple Maps where I live and travel. However, I like having options so it will be nice to have another option when navigating with CarPlay now. I think a lot of those holdouts were stubborn and trying to do their own thing baked in to their "infotainment" systems. Toyota was holding out for a while but has seemed to have given up and adding support for CarPlay. Exactly this. Like Chrysler wanting you go pay ~$600 to "activate" the navigation that was already built into your uConnect radio. The folks demanding CarPlay integration are finally winning out against the automakers charging ridiculous fees just to "turn something on" that's already built into your system. Question - will the car firmware need an update to use the new iOS 12 or is CarPlay compatible with any new iOS update? Think of CarPlay as an app built into iOS. The infotainment center basically just acts as a monitor for CarPlay, so new firmware for the car should be unnecessary. So basically, yes. 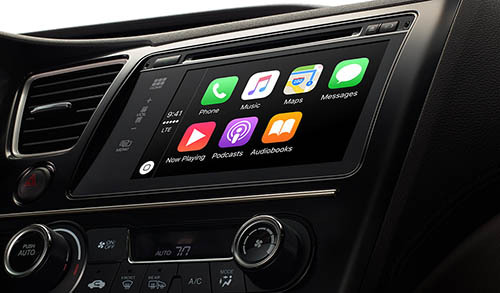 Cars which support CarPlay should support CarPlay for time and all eternity, unless apple changes the protocol with which phone and infotainment center communicate with each other. Waze is in beta right now.